Last time I got up close with sleeping Hymenoptera, I was shooting Nomada, also known as cuckoo bees. 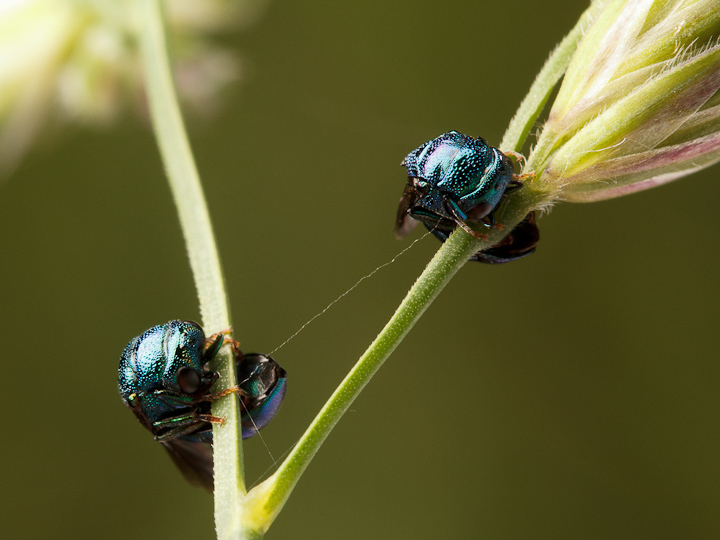 Friday night, about 100 m from my new apartment, I shot some Chrysididae, also known as cuckoo wasps or jewel wasps, which are also nest parasites of stinging Hymenoptera. 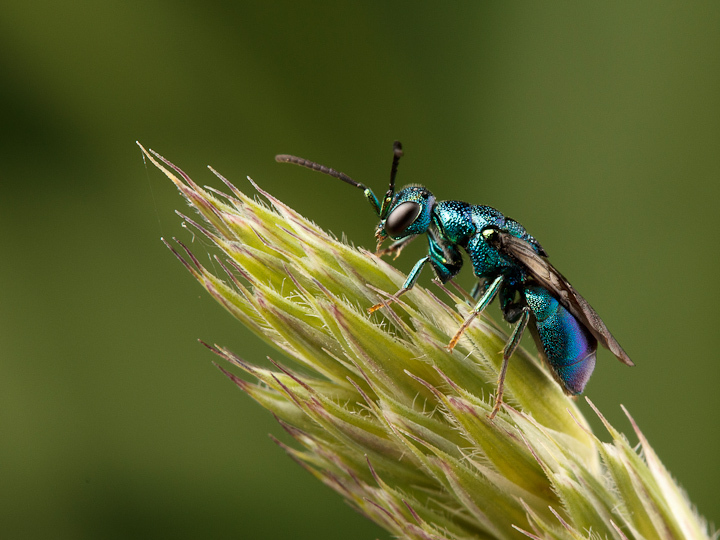 These gorgeous little wasps are super tough (if you have ever pinned them) with a highly sculptured cuticle and the ability to roll up in a little ball, presumably for defense while dealing with stinging hosts. 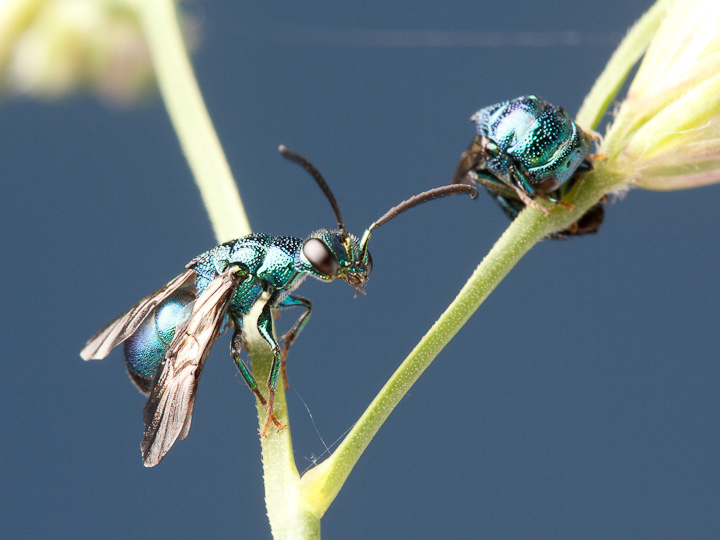 Peering at a series of pinned cuckoo wasps in Intro Entomology was a big part in winning me over to study insects! 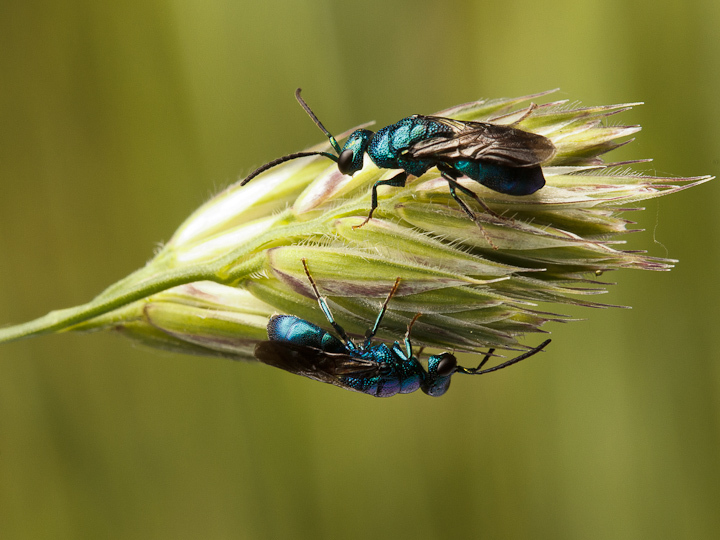 Unlike other sleeping hymenopterans I have shot (Coelioxys, Megachile, Nomada and Ammophila), these guys seem to use their ball-rolling muscles to cling on to the grasses. Because they were so small, I was wishing for more magnification…I could not even find my extension tubes! 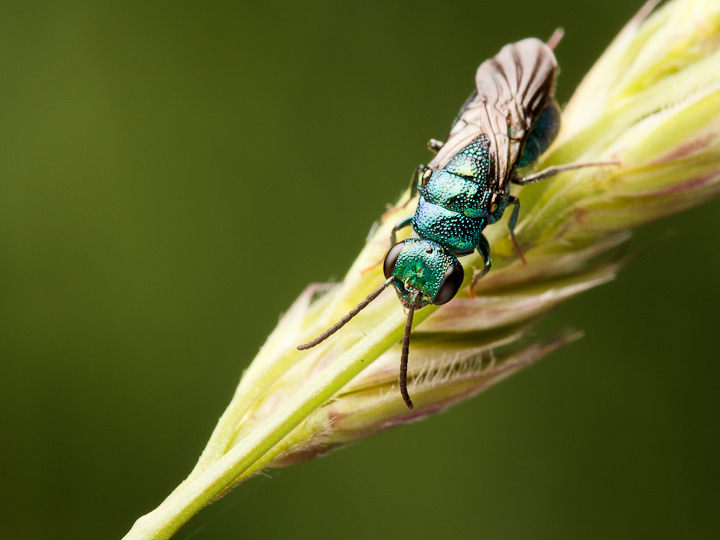 These wasps are some of the most gorgeous insects around. Here you can see the wasp’s feet clinging on, as well as the concave abdomen which also facilitates the defensive posture. I tried getting both of them to sleep on the same flower, but they seemed to maintain a sizable personal space. While I was doing this, late-foraging yellowjjacket queens were examining the tops of the grasses as well. 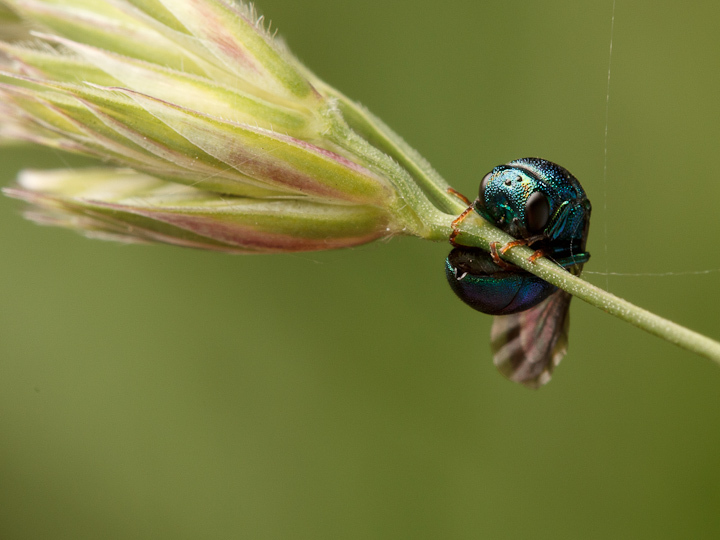 There were also many sleeping blowflies on the grasses, which may have been what the yellowjackets were hunting for. Here the two cuckoo’s are finally settling down again. They both appear to be male, with 13 segments on the antennae. A bit of stretching before bed. They seem to be connected by a detached bit of spider silk. In the morning I went back to the site, and both were still on the same plant. Here one of the wasps cleans his eye. And appears to be ready to start the day! 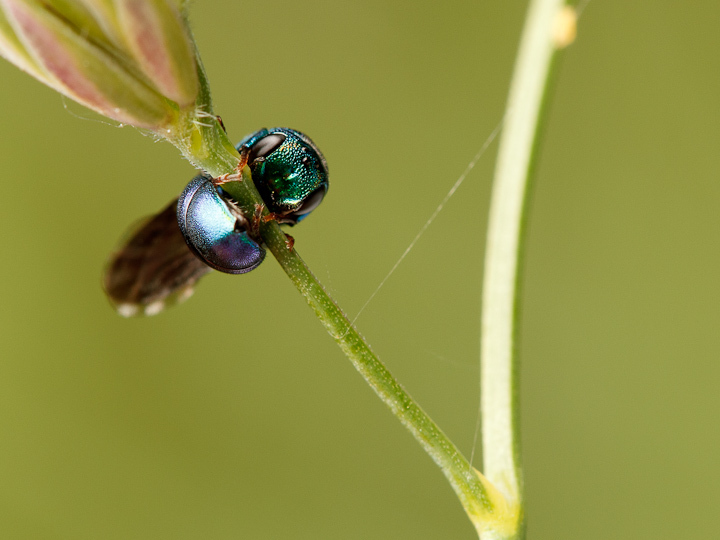 These photographs of such tiny creatures remind me how unexpectedly beautiful even a fly or a wasp can be. 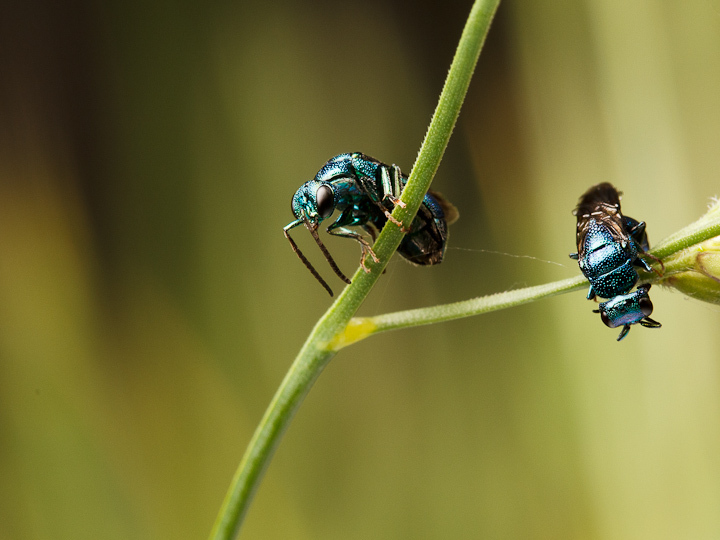 They are certainly spectacular insects! 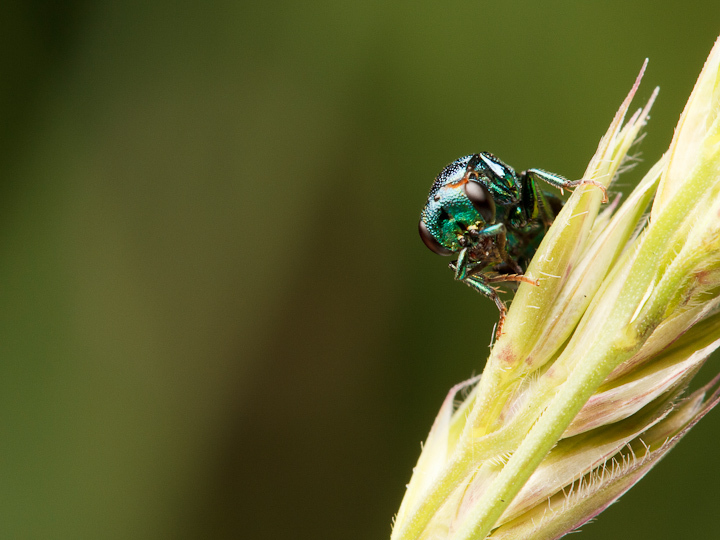 That is what I love about photographing the tiny creatures: there is such beauty everywhere, even in the midst of a city.